Home » diary , essay » Together to Spend the State’s Budget In the Year-End! Together to Spend the State’s Budget In the Year-End! Am I a corruptor? Don’t answer yes or no before capturing this note below. It's actually done after the case but I kept it on my file-shelf to fit a good time to publish. Having had long and exhausted trip to spend 2011 new year holiday with my Peace Generation friends—staying awake for whole night on shore, playing games, singing, dancing together, also grasping and praying for our hopes in one year ahead—I got my body lay down on bed for about half of the day, January 1, 2011. On that day I was utterly wearied of doing everything and wanted to make free of my body and feelings for stalking a new spirit of tomorrow. Yeah, I dedicated that day for only taking a rest. In the afternoon I was woken up by cell-phone ring from the staff of university, where I studied for undergraduate, who had me send curriculum vitae back to him directly by short message service (SMS) at that time. It extremely didn’t make sense to send three full-papers of my CV only by SMS. What is it for? I asked him. Someone on the phone, whom I tremendously admired due to his dedication of helping many processes of my undergraduate study and commonly appointing me for several achievements as delegation of the university, told that I was advised by the university to delegate me in competing an annual award of the national state Islamic university students on Appreciation Night and Amal Bhakti of Religious Ministry Republic of Indonesia. Okay I sent my brief CV by SMS to apply for this “tendentious event” anymore! I was so sure I would count in this event later. Yeah alright! On the morrow my guess came true when I got a call from the committee of the event that I was selected and alleged to attend it in Jakarta. He made me prepare and head Jakarta by plane before 7 pm, on January 02, 2011. It’s 9 am on my clock so that I must jump out from bed and mess it up to packing my stuffs in hurry, look for ticket reservation, then go to Jakarta as imminent departure. All accommodations will be covered by committee so I felt free to go by Garauda, as national-pride airline, to Jakarta. It’s crazy day for me because everything was in haste and I hated to be like this. It’s out of my life habit anymore. But it’s okay because I will come over to event of which many bossy staffs of Religious Ministry attended it and I was able to meet them to fulfill my sick and nauseating feeling of the governments who break this country down for years with corruption cases. I’m a little rebel for this since I know well how suffering and getting the bad fall of poverty among the people and grass roots in remote areas and small farmers in my village. Thee need to know that they likely don’t have any hopes for tomorrow because their incomes have not for years risen up properly whereas costs of the basic necessities dominated and organized by market and state come up with highly-cost standard. The rich men—businessmen, bureaucrat and military—who corrupted with state, more and more will be richer, the poor people more and more will be poorest! My gratitude to God because I just arrived in Jakarta airport and had a safe trip. Don’t think of Jakarta too much except traffic jams and unfinished cityscape management. Yeah, traffic jams are the biggest and hardest problems of my capital city todays. So, keep it in your mind don’t arrange your table and schedule too tight unless you had lost many chances due to traffic jams! I came over to Lapangan Benteng St where the headquarter of Religious Ministry office is to be with no idea of about the event. I was welcomed by one of committees then took me into hotel to drop my stuffs and had a nap for couple minutes. Before separating, we made appointment to meet him at hotel lobby on 7 pm. So I had 1 hour more to take a nap and take a bath before attending my unrecognized event. At 7 pm I went to Borobudur hotel, close to office of Religious Ministry. I came in and saw a marvelous atmosphere and classy event inside the room with people surrounding the table who asserted themselves as official state level, with authority and high-class people. I read wall-banner “Apresiasi Malam Amal Bhakti ke-65 Bidang Pendidikan Islam Kementerian Agama RI Tahun 2011”. 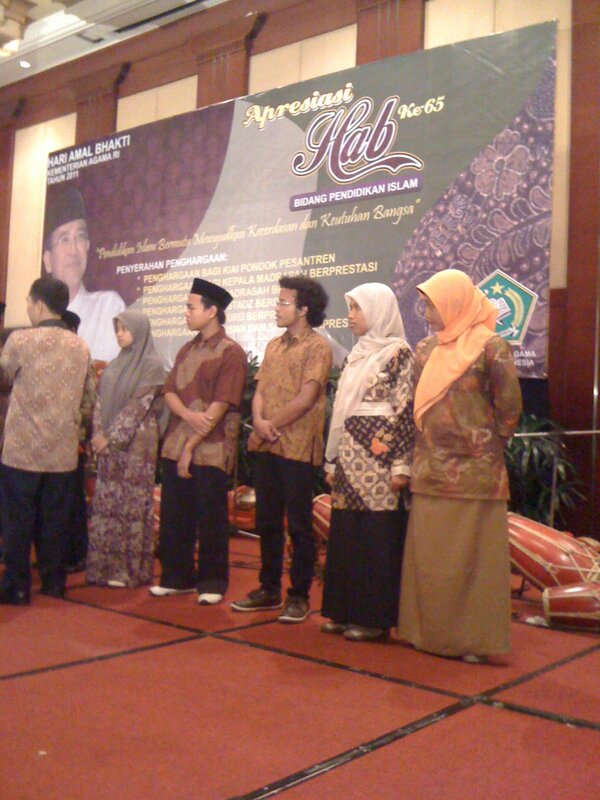 Students, teachers, and office staffs of Islamic Educations (Madarasah and Pesantren) throughout Indonesia with many categories were invited to achieve the awards. I thought-out of myself at that time as student who was appreciated by state in behalf of Religious Ministry’s Islamic Education. Did I deserved it? I didn’t know certainly. I just wanted to ask about how did they run the selection and what should the eligibility be prepared? I did nothing for this but sent the CV only by SMS! Nobody can answer my questions even though I asked the committee. With deep breath he said, we’re in haste due to the program of year-end (kita memang terburu-buru Mas, secara ini program akhir tahun!). I said no words to respond him and just kept silent for few minutes. Yeah, I knew this way! Okay it’s an important learning for me to disclose detailed program of my governments. It’ couldn’t be run further. It’s stupid and weird way of irresponsible person. In this event I awarded money 5 millions IDR and certificate that stated me at category of productive writer from Islamic State University of Sunan Kalijaga Yogyakarta. The two other students of university came from UIN Malang dan IAIN Walisongo Semarang. I sincerely thought this event was all about in haste and unorganized program of year-end because it’s broadly speaking that Indonesian governments and states apparatus usually spend a lot of money for unfairly-made events in the year-end, only to spend budget without seeking the valuable and prosperous program for people. I hate this indeed! Anyway, you're not anonymous Bje! You deserve it, you're very good writer! Thank you Mas Wiwit for stopping by here at this little note. I also got so much inspiration by your way you write "the weird reality" showed by state apparatus. Yes we have official governments with bunch rules and laws, instead, but I feel like none to protect people under the state. Anyway, keep on gearing to change the wrongdoings systemically made. Just hope for the young leader of tomorrow to carry it out on the right way for prosperity. Keep fighting for everything which will break this nation down. We need an awarness to disclose the hardest "latent problem", and you've already begun!